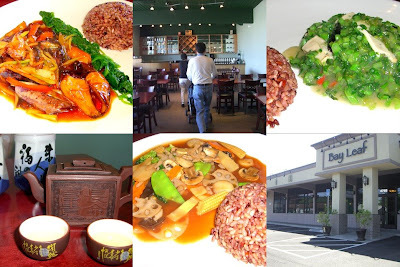 Recently, we discovered an Asian inspired vegetarian restaurant in Portland, Oregon. Our family friend, Winston, is a loyal patron of this eatery because he is a “part-time” vegetarian. According to him, this restaurant does not cook with garlic. Some vegetarian avoid eating strong-smelling plants such as onion, garlic, chives, shallot, and leek. There was an item on the menu that said leek, but when I asked the server, she explained that it is not leek as printed on the menu. They could not find a better translation for the kind of vegetable that they use. She also explained that it is hard to translate “monkey head” mushroom (猴頭菇) because the direct translation name would frightened her American customers. My husband and I had a pseudo lunch date this afternoon as Little Tiger (9 yrs old) and Little Dragon (6 yrs old) were at their schoolmate’s birthday party. And Little Chicken (23 month old) slept through our entire meal. Our family friend said to cover the flash on the camera with a piece of handkerchief to produce soft lighting. One of the food photo was taken using his technique and his handkerchief. Here’s a couple of links to this restaurant’s review: here and here. Did you try their vegetarian desserts? And whats the top left picture? The one with the red rice and green vege? Looks really nice. What’s the name of the dishes you ordered? We ordered lunch special and it came with sweet and sour soup and 3 grain rice. Here are the dishes, from left to right, eggplant with spinach, lotus root stirfry with vege, a kind of preserved vege (shue li hong in Mandarin) with beancurd. p/s Teckiee, we did not try any vegetarian desserts. I wonder what is vegetarian desserts? Photos at the bottom are desserts? Ha Ha! p/s But seriously, I wonder what kind of desserts makes it non-vegetarian, if any? I don’t know any desserts that has meat, onion, garlic, chives, shallot, and leek. If I get a chance, I will ask my vegetarian friends to educate me. Looks good. I think you can make vegetarian dessert using sunflower oil, soya milk, fruits to make a cake right? Does it have that many pastries? I feel a little dumb for asking that question now. But I guess if I don’t ask, I don’t know. I saw ice cream on this vegetarian restaurant’s menu. I wonder what is the substitute for cream in their ice cream…. 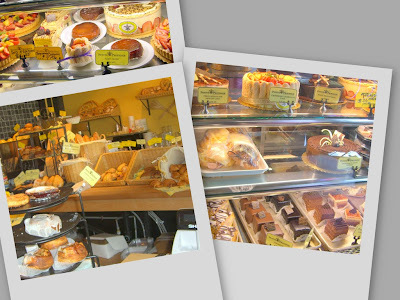 The Vegetarian Restaurant is near a French Bakery that sells bakery. I did not provide a review on this restaurant but I gave a review link to those who are interested in going. So how did you find the food at the vegetarian restaurant? I can’t imagine a restaurant not using garlic at all! I like the “Leek” and Broad Bean appetizer. My husband started to eat before I had a chance to take a photo of it. By the time I got my camera out, there were just little piles of green stuff on the plate. So, I did not take a photo of it. I have never had the vegetable that she labeled as “Leek”. She said it is “Chi Chai” in Mandarin. I thought the taste was rather unique, in a good way. If I go back, I would like to try other dishes that are not on the lunch special. I was told that their dinner presentation is impressive, with carved tomatoes, etc. I agree, it is hard to imagine a restaurant not using garlic or high stock. However, I think they did a pretty good job of substituting garlic with other flavors. It is not easy to produce high quality vegetarian food. So, I encourage their efforts to continue improving their menu. Winston is our family friend. His wife and two boys are in Taiwan for a one month vacation. He can’t go with them because he just started a new job. 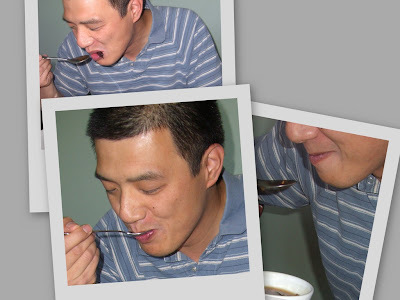 So, I thought I cheer him up with a few photos of him “shyly” sipping his soup. I can understand that strong-smelling foods can interfere with concentration. That explains why some people avoid these foods. I thought I was cheering him up. Instead, he is cheering me up! He just told me that he liked my blog and he has forwarded my blog to his friends and family. He has many friends, so I think my blog stats is going to exceed its normal number for the days to come. I have eaten at indian vegetarian restaurants that also don’t use garlic and onion in their recipes. I suppose the theory is the same, as what Argus mentioned above. I would eat monkey head mushrooms! hi lee ping…i’ve wanted to try that restaurant, now that i know that there’s a bakery nearby, i’m more eager to go! Aah, yes. Indian food uses all kinds of spices to enhance the food flavor. I am into Indian food these days. I have included several links to Indian recipe blogs on my blog. I don’t think I will ever run out of ideas to blog because there are so many different “hip” foods in this world. p/s Hope you had a good birthday celebration with Bald Eagle. After reading your comment, I researched on “Monkey Head Mushroom”. There is really such a mushroom called “Monkey Head”. The server really knows what she was talking about. Here’s the definition of Monkey Head Mushroom from Wikipedia. If you go, let me know your feelings about this restaurant and the bakery next door. You can send me an email, if you prefer. I found your blog while I was going over my Technorati. I found you through Jaden Steamy Kitchen. You are an amazing woman. After I clicked on your new blog, I was impressed by the professionalism in your style of writing. I was even amazed when I clicked on your old blog and it was written in Bahasa Indonesia. What’s more amazing is that you are located in Oregon, where I live! So what was it that was not leek? And what words did they use to substitute “monkey head”? The server said it is not Leek but it is a kind of chinese vegetable call “Chi Chai”. And “Monkey Head Mushroom” is “Lion’s Mane Mushroom”. I noticed that Wikipedia used both of these names. I guess the server thought “Lion’s Mane Mushroom” is a much more friendly name than “Monkey Head Mushroom”. p/s Good info you have on berries in your blog. I love summer time. I am able to eat all kinds of fruits. Trader Joes (in Beaverton, Oregon) sells “White Apricot”. The label said “Saintly Angelcot“. Sure enough, the taste was divine. I bought a package yesterday. This afternoon, after church, I persuaded my hubby to go back to Trader Joes. I bought 6 packs of “Angelic White Apricot”! came to ur blogspot site thru harimau’s blog. wow … nice vegeterian restaurant. been a while since i’ve had vegeterian food. make me hungry now. You are located in Los Angeles. There must be a few good Asian inspired Vegetarian food where you are. Welcome to my blog. I found your blog from one of my blogger friend, Steamy Kitchen. You have a hip Indian Food blog. I am into Indian Food, especially now in the summer time where I don’t have much appetite because of the heat. I have included a link to this restaurant’s reviews. If you ever come to Portland, check out their reviews to get an idea on what to expect. You mentioned that certain section of people in Southern India (in the old days) do not consume anything that grows under the soil like onion, garlic, radish etc. And most Southern Indian vegetarian recipes are devoid of garlic. That is interesting. One of the reasons why I like Indian Food is the combination of spices and not long ago, I learned from Auntie Lily how to make Roti Canai Sauce. The major ingredient was Dhal (Lentil).